With the US Postal Service recently in the crosshairs in the on again/off again feud between the world's most powerful man, US President Donald Trump and the world's richest man, Amazon CEO Jeff Bezos, today's otherwise boring earnings release by the USPS got some additional scrutiny by the investing public. 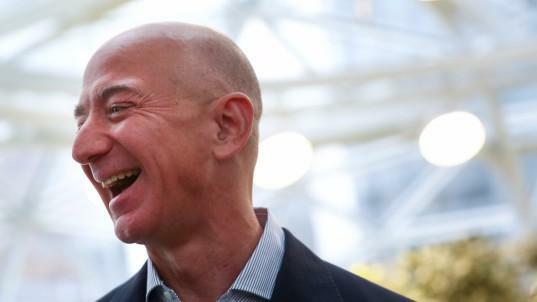 The report had some good, but mostly bad news, because whereas revenue increased modestly in the quarter, largely thanks to a 5% jump in package volume - thanks Amazon - even as mail volumes declined by 2.1%, expenses soared by 5.7% in the quarter, mostly as a result of unsustainable increases in retiree health benefits, which surged by $766 million. The result: a total quarterly loss of $1.3 billion. “Despite growth in our package business, our financial results reflect systemic trends in the marketplace and the effects of an inflexible, legislatively mandated business model that limits our ability to generate sufficient revenue and imposes costs upon us that we cannot afford,” Postmaster General and CEO Megan J Brennan complained. “America needs a financially strong Postal Service that can invest in its future and can continue to fulfill the needs of American businesses and consumers. With continued aggressive management and greater legal authority to respond to changes in our marketplace and to control our costs, the Postal Service can return to financial sustainability." 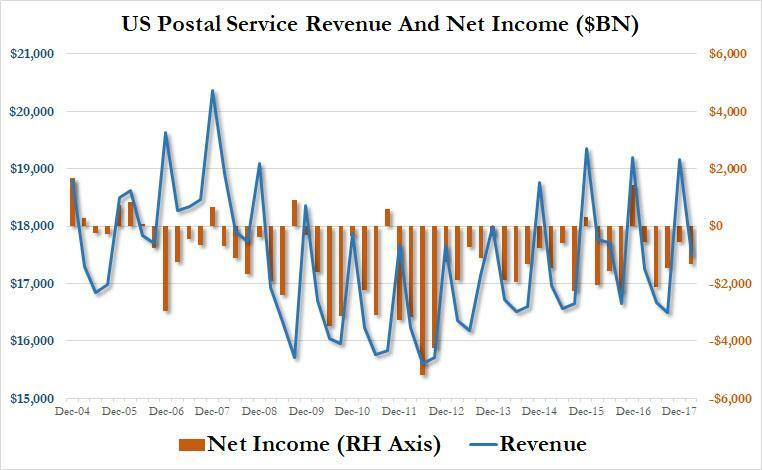 Until then, what the USPS will continue to do is effectively subsidize the Amazon business model, even if it means buying the effectively insolvent USPS a few additional years of life. 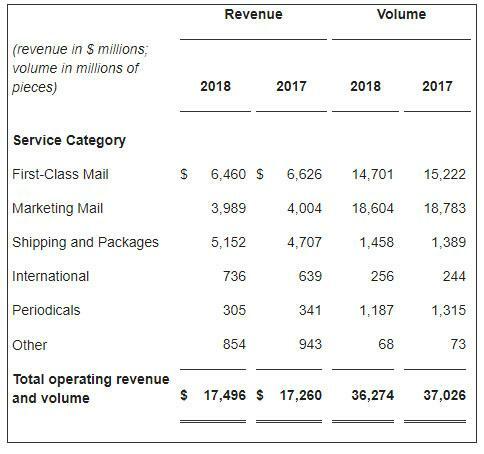 Total revenue of $17.5 billion for the second quarter ended March 31, 2018: an increase of $235 million, or 1.4% Y/Y, as shipping and packages revenue grew by $445 million, or 9.5% while First-Class and Marketing Mail revenue fell by a combined $181 million. The trends observed in previous quarters persisted as growth in package volume grew by 69 million pieces, or 5.0% (Amazon), while snail mail volumes declined by another 700 million pieces, or 2.1%, compared to the same quarter last year. The total "controllable loss" for the quarter was $656 million, compared to controllable income of $12 million in Q2 last year. This was driven by a $236 million increase in the cost of retiree health benefits due to changes in actuarial assumptions and a $364 million increase in compensation expenses due to additional hours incurred to support the labor-intensive package business as well as contractual wage adjustments. Additionally, transportation expense grew by $155 million due to highway contract rate inflation as well as higher fuel costs. 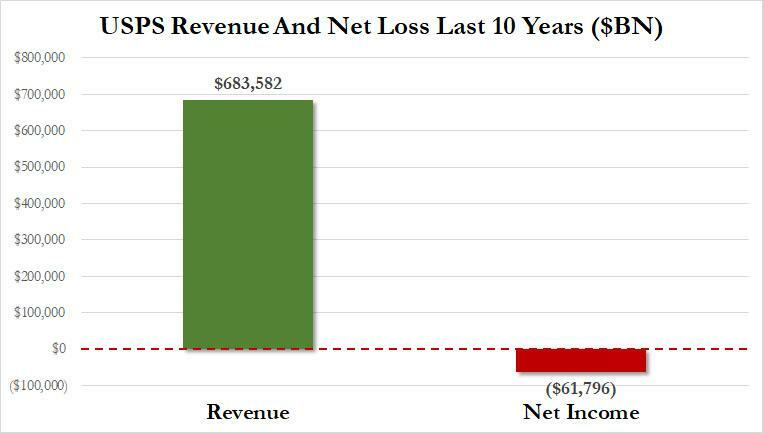 ... and which despite generating $684 billion in revenue over the past decade, has managed to lose nearly $62 billion, an effective - and subsidized - transfer of wealth to that "other" company. Or, to loosely paraphrase Jamie Dimon, there's a reason why the man in the photo below is richer than (all of) you.